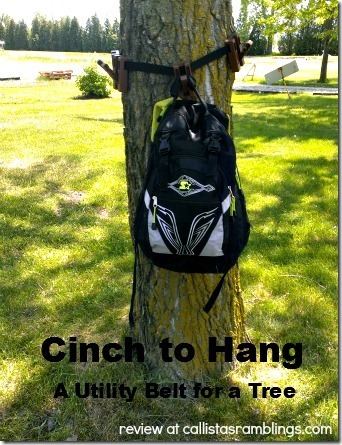 The Cinch to Hang is an all purpose outdoor organizer. Have you ever tried to hang something from a tree? I know when we go camping we usually want to hang our lantern from the tree. Sometimes you are lucky and someone else put a nail in the tree (which is actually illegal) or there’s a low branch or something but not always. 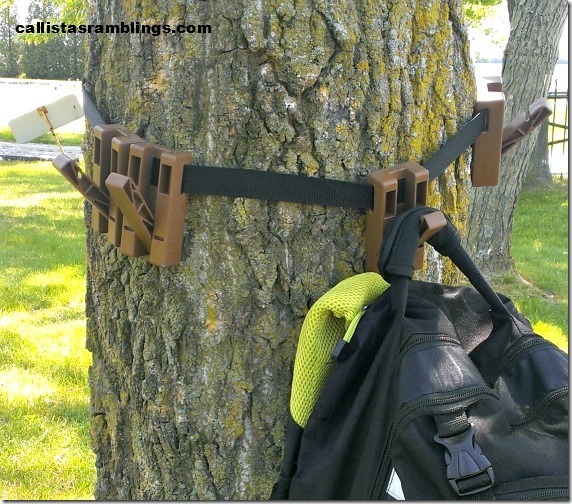 The Cinch to Hang simply wraps around a tree like a belt and has 4 plastic hooks that you can open up to hold your stuff. It could be a lantern (battery operated I’d recommend since it’s not held away from the tree), hiking boots, water canteen, wet towel, backpack and whatnot. The system is designed to be eco friendly and will not harm the trees in any way. It’s specifically designed to not interfere with the tree’s bark, even when weight is on it. The belt part can be adjusted to fit pretty much any size tree although a smaller one won’t allow for as much room to space out the hooks. Alternatively you can not use all of hooks. It will fit at least 65” around which is a pretty big tree. Each hook can hold up to 50lbs! It’s not only for camping or picnics. Use it at home in the backyard for hanging plants, gardening tools or your towel when you are in the pool or sprinkler. Use it at the RV or while fishing. I’m going to take it to Girl Guide Summer Camp with me in August. I’m sure I can come up with many different uses for it. Currently the Cinch to Hang is only available online but hopefully that will change. You can buy a 2 pack (two hooks) for $18.95 or the 4 pack for $24.95. Alternatively, for a little more money, you can purchase the Hunters Cinch to Hang which is in a camo design. *Disclosure: I or a member of my review team received the product mentioned above free of charge by the company or PR representative in exchange for this post. No other compensation was provided. See my Disclosure Policy for more information.